It takes a lot to put on a production on the scale of Sunday night’s Grammy Awards. To present the annual music industry honors to the attendees at Los Angeles’ Staples Center and to home viewers on CBS, show organizers use more than 450 microphones, 155 tons of lighting, 13,000 amps of power, 19 video screens, 94 speaker cabinets—and an endless amount of Macs. You may have assumed that Macs played a large role in putting on what has become the largest audio production on television. But until you sit in on a rehearsal for the telecast, as audio engineers are hard at work mixing the 35 songs that will be performed during Sunday’s ceremony, and see how extensively Macs are involved in the process, it’s hard to fathom just how central the Mac has become to the Grammys. Every piece of audio from the Grammy stage goes out to one of two remote mixing and recording trucks located behind the Staples Center. The main truck cost in the neighborhood of $750,000 to build, and it’s about as state-of-the-art a setup as you’re likely to encounter. During Thursday’s rehearsal, it was easy to lose count of the number of Macs in the production truck. But there are 14 Macs on board, according to Joel Singer, audio engineer in charge for XM Production/Effanel. That includes MacBook Pros, Mac Pros, G5s, and a G4 capturing video from the stage. Singer said that the Grammy production team has always used Macs to produce the show’s audio, and it will continue to do so. This pair of Macs are just a drop in the bucket when it comes to the Mac hardware responsible for putting on Sunday’s Grammy ceremony. 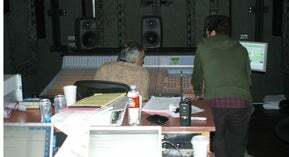 To make the Grammys sound even better for the viewing audience, Singer and his crew sonically duplicated the first truck and built a second mixing truck that sits right beside the first. When an artist comes on stage, audio mixers John Harris or Eric Schilling start working with the audio. When that song is done, one of them takes the mix settings from the Pro Tools setup on a thumb drive, along with a hard drive that has the audio, and head over to the second truck. While one person is over there, mixing the first song, the other remains in the first truck, starting to record the next rehearsal. When that’s done, then they switch places again. Audio mixer Eric Schilling (seated) mixes one of the songs during rehearsals for Sunday’s final performance. In the past, Singer says, mixes would only have a few short minutes between acts to mix the songs. The second production truck gives them more time to tweak the mix, getting it just right for the final show show. When an artist walks onstage to perform Sunday night, the crew in the truck are punching up the settings they worked on during the week, and everything is ready to go. 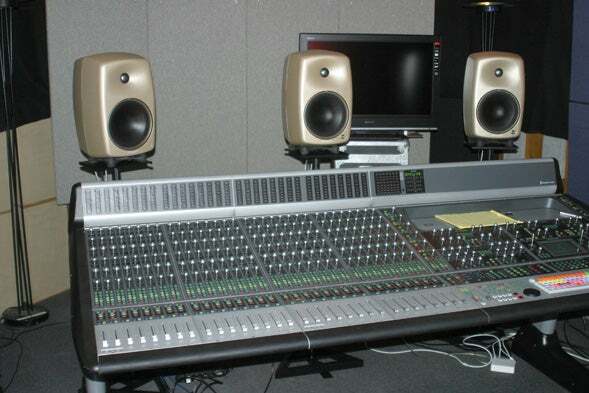 All of the mixing consoles are made by Digidesign, which makes the Pro Tools digital audio workstation. 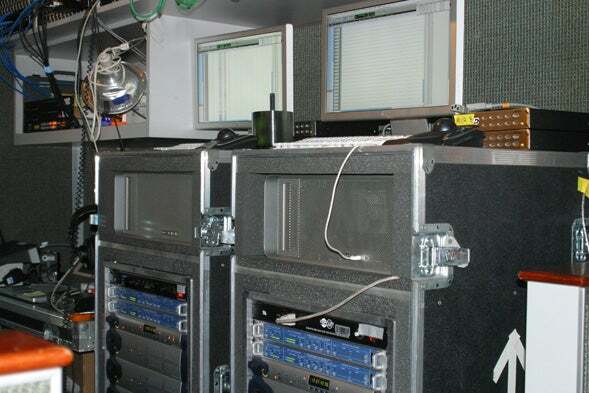 In fact, a lot of the gear used to produce the Grammys comes from Digidesign. That’s what the majority of the recording industry uses, says Hank Neuberger, supervisor of broadcast audio and recording academy advisor, so that’s what the Grammys broadcast uses, too. An up-close look at one of the mixing consoles in one of the two mixing and recording trucks parked outside the Staples Center. Production work on the Grammys this year will go beyond what you see and hear on television. The first part of the 2008 ceremonies will be Webcast, so you can see all of the awards that aren’t typically televised. For Mac users, that can be a double-edged sword, especially when production companies skew toward Windows-based technologies. That won’t be a problem with the Grammys webcast. The 50th Grammy Awards takes place this Sunday at 8:00 p.m. Eastern on CBS. (The West Coast gets a tape-delayed broadcast also airing at 8 p.m. local time.) The webcast kicks off at 4:00 p.m. Eastern. The Grammy Awards show is the largest physical production of an annual awards ceremony. This year’s show is the biggest in the Grammys 50-year history. It takes about seven days with several crews working 24 hours a day to load and hang all of the equipment. There are more than 800 computer controlled lights. The production team will use 19 high-definition cameras. Rehearsals and sound checks take four days. Around the Staples Center, there are 19 video screens including a 7.5-ton LED wall coming out of center stage to display all the action.